Chris Difford and Glenn Tilbrook had been in the band Squeeze since 1974. After eight years, the band broke up as a result of conflict between (other) band members. 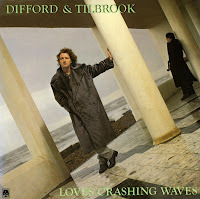 Difford and Tilbrook continued to work together, and released one self-titled album as 'Difford & Tilbrook' (1984). The album is considered to be a 'lost' Squeeze album since Difford and Tilbrook were the only constant members of that band, which reformed already in 1985. 'Love's crashing waves' was their debut single, taken from that album. I remembered it because I thought the song was very boring - probably a result from the accompanying video which was played on television repeatedly in 1984. In 1998 I bought the single after I found that the chorus was still in my head after not having heard the song for over a decade. I had a hunch, and I was right: now I like the song.